The first thing you should do when you are planning to buy a motorcycle camper trailer is visit your local dealer. All states have an RV store where you can find all kinds of travel trailers, including motorcycle campers. If you happen to have a dealer in your area of one of the companies that manufacturers motorcycle trailers, you are even luckier. Look for dealers of Roadman campers, or Kwik Kamp trailers. The second option is to look online. If you would prefer a second hand trailer, this is the better option. 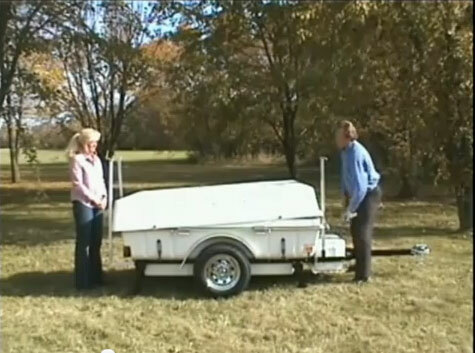 There are various websites that sell new and second hand motorcycle trailer as well, here are just a few: www.roadmancampers.com, www.trailmasterinc.com and www.compacttrailers.com. These campers are small enough to be towed by a motorbike, with quite a lot of storage space. However, these trailers are not like the regular pop up campers. To save space, they have a different method of setup. It takes about 7 minutes to set up such a camper, by using polls and holders. This way you will have a quite big space without the extra weight of a pop up mechanism. 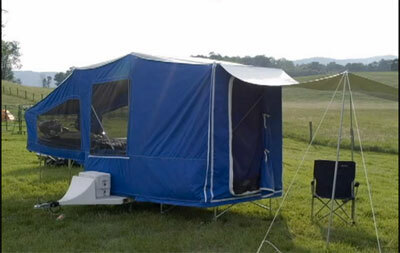 Roadman motorcycle campers resemble a tent, with sleeping area and kitchen area as well. Roadman campers have an aluminum frame, 500 lb torsion suspension, diamond plate fenders, carpeted floor and inside lid, adjustable steel awning poles and heavy duty, high quality canvas. Overall length of trailer 86"
Aspen motorcycle campers share the qualities of this type of RV. This model has adjustable stabilizer corner jack stands, 'Torflex' suspension, and a seamless, single piece construction for sturdiness and durability. The bed boards have a framed aluminum construction. It has a triangulated frame for a stronger construction. 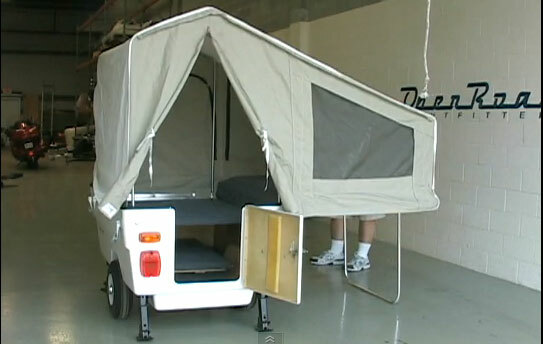 Center isle 40" x 78"
Roll-a-home motorcycle campers have many features that makes them one of the most popular brands. They have a white or black gel coat fiberglass body, self supporting accordion style setup, tempered anodized one piece aluminum poles, five screened windows and screen door. The stylish tent has an interior height of 88" and a sleeping area of 47" x 78". Overall open length 16 ft. Floor area 47" x 78"
These camper trailers are not only very convenient and easy to set up, but also come in very cool elegant colors, such as white, black, light gray and beige. There are more models to choose from if you like the Bunkhouse Motorcycle Campers. 17 Cu. Ft. of Storage. With the new design of this camper you won't have to struggle anymore with poles to raise the tent up. It has a comfortable full size bed where you can sleep comfortably no matter what the weather conditions are like. It can be set up in only 2 minutes and the bed area can be converted into a sitting area during the day. Even though both companies shut down some years ago, their campers can still be found in many offline and online stores. There you can also find individual specifications for each model. Roomy, fancy and affordable: these are the main traits of the Time Out Motorcycle Campers. They have many models which assure variety in both looks and comfort. This is a page for classifieds where you can find cheap motorcycle campers. Among the listings you can find all kinds of campers and trailers that are small enough to be towed by motorcycles. They have models made by various manufacturers, you can find here 2011 Viking Express Tent Trailers, 2007 Aluma Motorcycle Camping Trailers, Kwik Kamp tent trailers and more. If you are looking for a bargain, eBay is always a good choice. On eBay you can find plenty of shops and stores or even private people who sell campers of all kinds, including motorcycle campers. Not only that you can get great deals there and find very good discount trailers, but if you are lucky and you want to try the bidding system, you might get a trailer for a very good price. Ebay also has special sections for camper trailers. This website is a place for millions of classifieds, having a system which makes easy to find camper trailers right in your area. They have for sale all kinds of second hand motorcycle camper trailers, such as Shur-Kamp Motorcycle Campers and others. I have seen a few ads for used motorcycle camper trailer for sale in various different places online and off line. 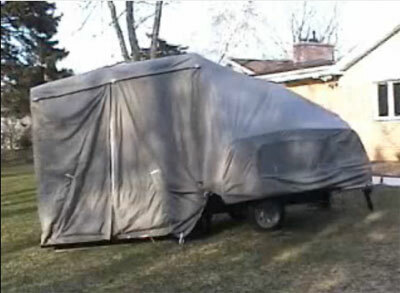 I believe the motorcycle camper I saw in Nebraska listings was a replica of the Teardrop camper constructed by a private party in 2002. He had used Teardrop camper plans to make a cute little trailer. The interior and exterior pictures gave a good deal of information about the Teardrop camper for a motorcycle. Because these campers are made for the size and convenience of a tiny trailer, they make great little tow behind campers for motorcycles. The quality of the campers is great and the ability to tour the countryside with a bike and camper trailer adds to the beauty of it all. When you look for a used motorcycle camper, you want to find one that will be compatible for towing and allow for a comfortable sleep as well. I did see a different type of motorcycle camper for sale; it was a 2001 Roadman camper trailer for a motorcycle. It actually is quite compact and opens into a pop up type tent camper. These campers weight about two hundred and twenty-five pounds and tow very nice behind the bike. I believe I saw this ad in a Nevada camping magazine for motorcycle camping enthusiastic. I have seen a used motorcycle camper trailer for sale with the bike included. The motorcycle was a trike conversion, which is a three-wheeler bike and they had a little motorcycle camper behind it. It was actually a great price for both of them. If you see these units, you should check out the inside, it is very nice considering the size. Camping and motorcycle riding do go hand in hand when you have the right equipment and the ride weather conditions.